in genetics, loss of genetic material from a chromosome. 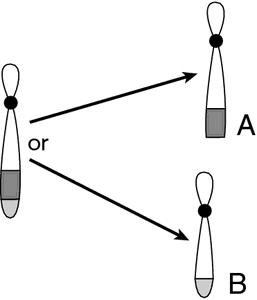 Examples of large-scale chromosomal deletions: A, terminal; B, interstitial. From Dorland's, 2000. 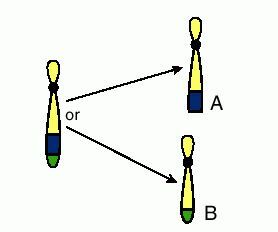 In genetics, any spontaneous elimination of part of the normal genetic complement, whether cytogenetically visible (chromosomal deletion) or found by molecular techniques. /de·le·tion/ (dĕ-le´shun) in genetics, loss of genetic material from a chromosome. Examples of large-scale chromosomal deletions: (A), terminal; (B), interstitial. 1. The act of deleting; removal by striking out. 2. Material, such as a word or passage, that has been removed from a body of written or printed matter. 3. Genetics The loss, as through mutation, of one or more nucleotides from a chromosome. the loss of a piece of a chromosome. genetics Any spontaneous elimination of part of the normal genetic complement, whether cytogenetically visible (chromosomal deletion) or inferred from phenotypic evidence (point deletion). In genetics, the removal of a segment of DNA with joining up of the cut ends. as in the loss of a segment of a chromosome. Deletion of a single BASE PAIR is one of the kinds of point mutation. Deletion of a base pair triplet (codon) will result in a protein with a missing amino acid. The absence of genetic material that is normally found in a chromosome. Often, the genetic material is missing due to an error in replication of an egg or sperm cell.